Greek political personalities accused of financial scandals: diversion or reality? A list of 36 political personalities, covering the whole political spectrum, has been “leaked” from the prosecutors’office to the press. A new turmoil has started since the accusations have not been proved. A member of parliament asked on the issue yesterday commented that the dogma of “innocent until proven guilty” has been reversed for the Greek politicians and the people think that they are all guilty until proven innocent! The particular moment chosen for the public announcement of the “leak” – the same day that the three government partners met and agreed on extremely harsh austerity measures causes considerable doubts about the validity of the list and the names in it. The Greek Supreme Court has asked that the case be instantly investigated in depth because it endangers the political stability of the country. – Tax offices are still on strike (how do they expect to collect taxes is a mystery) while the government partners are in (one more) meeting to discuss the latest austerity measures. – Scandals galore: while former Defense Minister Akis Tsohatzopoulos case is dragging on money laundering accusations were made against prominent New Democracy MPs and the Parliament Chairman Vangelis Meimarakis. – Disabled people demonstrating against austerity measures in Omonoia Square. – Temperatures are still in the summer scale. – The opposition is concentrating on suggesting counter-measures to the Government ones: Dimitris Papadimoulis, SYRIZA MP, answered the relevant question with two concrete proposals on National TV today: control the petroleum cartel and cancel an order for two German made submarines. The first move could bring prices down and the second bring about one billion to the state coffers. He went on to say that all private television channels operate on “temporary licences”. Air frequencies are a national asset and should be paid for, adding money to the budget instead of pension cuts. Government Minister M.Voridis had difficulties refuting Papadimoulis suggestions. Racist attacks reported daily. The latest one against the Tanzanian Community’s meeting place in central Athens. The police unable to provide proper protection according to the reports. 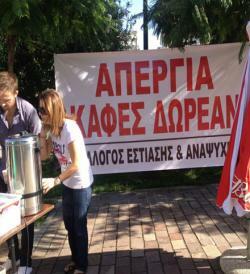 The workers striking in Greece today could chose their meeting place for the march towards Parliament. The Communist Party of Greece demonstration was called for Omonia Square. According to tvxs Secretary General Aleca Paparigas is leading the march towards Syntagma Square right now. The General Confederation of Greek workers (both private and public sectors) are meeting in Pedion tou Areos. Their intention is also to march towards Syntagma Square. According to participants it is a massive and enthousiastic rally. The news from the rest of Greece are also encouraging for the strikers. In Thessaloniki the march has started, in Pyrgos and other regional capitals shopkeepers are also taking part and especially in PatrasPatras restaurants and coffee shops have closed until 3 o’clock and have set up booths offering free coffee! The tax offices all over Greece will remain closed from tomorrow until Friday 28 September. The mass transport media will operate without disruptions all day tomorrow with the exception of OSE – trains- and ships. Flights will be erratic. The Communist party of Greece and its Union branch, PAME, have called for a rally in Omonia Square at 10.30 tomorrow while the General Confederation of Greek workers is organising its own demonstration in Pedion Areos at 11 o’clock. The latest on the Greek social media is the arrest and prosecution of a 27 year old Facebook profiler who posted a humorous text about a highly respected religious figure. Father Paisios, deceased, has become the bone of contention between extreme right groups and agnostic or atheist groups. Religious feeling has always been strong in Greece and has been expressed in many ways in the past, mostly peaceful. The arrest of the young Greek (and his nationality is stressed in the reports) comes on top of the rally organised by the Muslim community on Sunday morning. The demonstration was dispersed by the police but it fed phanaticism on both sides. The left wing opposition has stated its support to the young Facebook profiler causing contradictory reactions. It is noteworthy that a week earlier one of the SYRIZA MPs had asked for a change in the legal system so that blasphemy is not considered a crime! A general strike against the new austerity measures of the Greek government has been announced for the 26 of September 2012 with a rally in a central Square (Pedion Areos)the same day. The Confederation of Greek workers of the private sector (GSEE)and the civil servants Confederation call for a Panhellenic strike is supported by all opposition parties. The Unions statement rejects government interference with labour laws in the private sector, the abolition of collective work agreements and the rumours about the abolition of severance pay.GSEE also states that as long as “our lenders insist on the implementation of dead end policies the unions will continue and enhance their struggles. Primary school teachers Union (DOE) and the Athens’ lawyers Association have issued statements of participation while journalists are striking today Monday in order to be able to cover events on the 26th.